Millo left, Kevin center, Andrew right. All shadowed. Another great day to ride. There’s nothing better that sharply-defined shadows, your shadow, seen from a bike. Bonus points when that shadow is on the side of a hill, as you see in the photo. 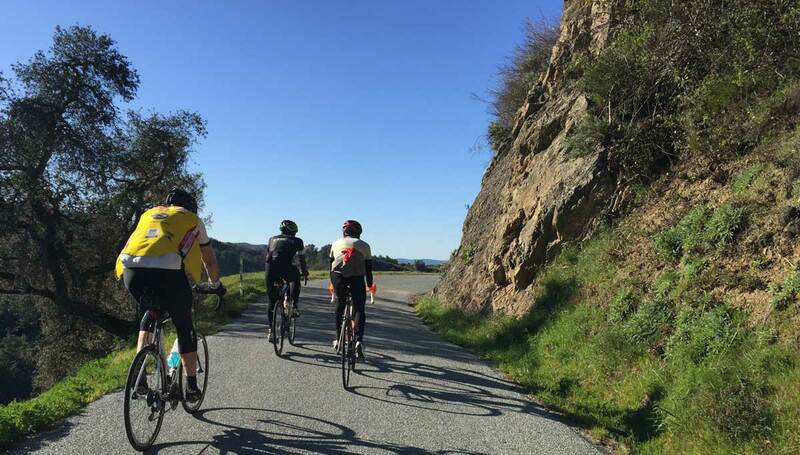 It’s still “winter” in California, and it’s still hitting 70 mid-day, still no threat of rain (although last Tuesday’s ride found pretty wet roads due to earlier fog). A bit on the cool side when we start, even saw just below 40 degrees this morning, but you don’t feel that once you start climbing. This morning Kevin and I were joined only by Karen at the start, an odd thing for such a nice morning. I joked with Kevin that we might still meet up with Marcus, and we did. A slightly-subdued Marcus after breaking some ribs in a mountain bike race, but still not a Marcus that I can keep up with! Marcus peeled off up on Skyline, just before we came across Millo, waiting for us near Skeggs (he shows up once in a while up on Skyline, having left a few minutes earlier, thinking he wouldn’t keep up on the climb up Kings). Karen peeled off at Sky Londa to get to work, but shortly after that we picked up Andrew, former Chain Reaction employee who got to the start of the ride too late so he rode the route backward until he found us. In the end we had Marcus, Karen, Millo & Andrew at various parts of the ride, but just myself and Kevin doing the whole route. Weird thing, that! Next Tuesday’s ride I’m not really looking forward to, as Daylight Saving Time returns so we’ll be getting up an hour earlier, once again a bit before the sun rises. Won’t take too long for that to correct itself though. Life’s tough if that’s the worst thing I can complain about!